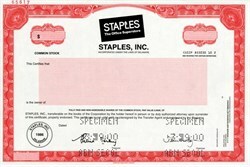 Beautifully engraved specimen certificate from the Staples, Inc. - The Office Superstore dated 2000. This historic document was printed by the American Banknote Company and has an ornate border around it with a vignette of the company's logo. This item has the printed signatures of the Company's officers. Staples Inc. is a large office supply chain store, with over 2,000 stores worldwide in 26 countries. Based in Framingham, Massachusetts, United States, the company has retail stores, serving customers under its original name in Australia, Austria, Brazil, China, Finland, France, Germany, India, Italy, Norway, Portugal, the United Kingdom, and the United States, while operating subsidiaries in Argentina as Officenet-Staples, Netherlands as Staples Office Centre, Canada as Staples Canada (Bureau en Gros in Quebec), and in Italy as Mondoffice. Staples also does business exclusively with enterprises in the United States and multiple European countries as Staples Advantage. Staples sells supplies, office machines, promotional products, furniture, technology and business services both in stores and online. The company opened its first store in Brighton, Massachusetts on May 1, 1986. Staples opened its 500th store in Vero Beach, Florida on July 5, 1996, its 1000th store in Duluth, Georgia on July 31, 1999 and its 2000th store in India in 2007.